Those of you familiar with Urban Orienteer should be aware of my current collaboration with Mark at Dancing Eye. Recently we have teamed up with two more photographers and an architect, and submitted the following proposal for an exhibition to coincide with the London Festival of Architecture 2010. Further details to follow shortly. Intended as a reflection on, and engagement with, contemporary discourse in Architecture and Urban Design, this group show will coincide with the London Festival of Architecture 2010. Collectively our work seeks to provoke debate and to stimulate ideas amongst those interested in urbanism and the city. 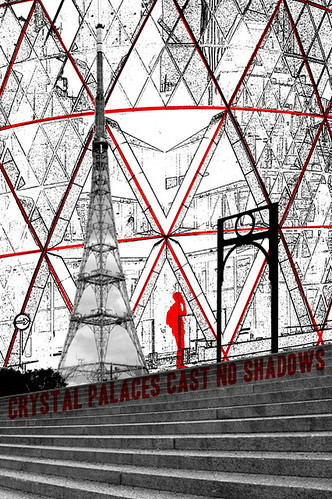 The material shown here comes from bodies of work that are continuing to develop, with In The Shadows of the Crystal Palace being a collaborative project in its own right. We are currently in discussion with several other artists, writers, and film makers whose work we believe may complement our own. If you would be interested in collaborating with us, on either this or any other projects in the future, please do not hesitate to contact us (details below). Hwei Fan Liang is currently teaching on the Architecture BSc at the University of East London. Previously working in practice, Hwei Fan studied at Cambridge, Kingston and UEL. Further details of Hwei Fan's work forthcoming. Please note that we are also seeking contributions from artists and illustrators for the next issue of Dancing Eye. Please contact Mark via his website for more information.